Bob's principal focus upon re-election will be jobs and the economy. We need to get Rhode Islanders back to work. Rep. Craven was recently proud to announce the passage of his bill, which repealed a state labor law and allowed Quonset to receive $6 million in federal funds. Just three months later, the effects of that bill were realized when it was announced that hundreds of new jobs and multiple new businesses were coming to North Kingstown. Legislators must focus on job creation as well as retaining and investing in local talent and innovation. Too many Rhode Islanders are out of work while too much skilled talent is leaving the state. Rep. Craven will support legislation that creates jobs while incentivizes our state as an advantageous place to live and work. 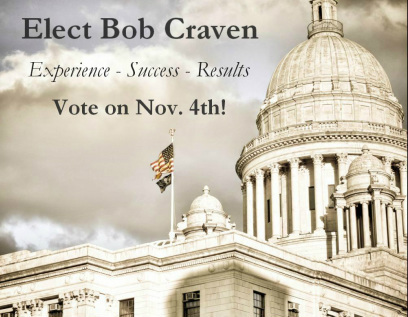 Rep. Craven prioritizes making Rhode Island a “business-friendly” state. Bob serves as Chair of the House Committee on Municipal Government. This puts him in the best position to improve how municipalities function and personally oversee their power to tax and regulate. He helped lower RI's corporate tax to the lowest rate New England, with hopes of bringing jobs to Rhode Island and strengthening our economy. However, more work needs to be done to bring businesses here. Next term, he intends on eliminating bureaucratic “red tape” so that small businesses and citizens alike can work with the cities and towns without getting the proverbial “runaround.” We need a comprehensive review of municipal regulations, taxes, and fees imposed by local governments. Our government should be encouraging small business, not hampering it. Rep. Craven and Speaker Mattiello meet with the owners of Wilson's of Wickford. The new House leadership is focused on jobs, the economy, and small businesses in Rhode Island. It is far too expensive to simply own property in Rhode Island. Bob intends to reduce or cap property taxes, as they are the most regressive tax in the state. Notably, North Kingstown residents are burdened by one of the highest property tax rates in the state, which must be changed immediately. Rep. Craven intends to eliminate the abuse and fraud that is rampant among our state’s social services. What began as modestly funded, temporary services for people in need, has turned into a permanent lifestyle in which the government has allowed recipients to become dependent. These programs must be continuously and thoroughly audited to remove unqualified individuals to ensure that taxpayers’ funds are being conservatively spent for their intended purposes. Moreover, our social welfare programs should be tied to getting recipients back to work. While these well intentioned programs aim at helping Rhode Islanders facing obstacles, their focus needs to be aimed at turning the recipients into contributors to society. We need to improve our public education system. We need highly effective teachers in every classroom and opportunities for every Rhode Islander - young and old - to receive a quality education. Let us educate Rhode Islanders so that they can start businesses, innovate, work, spend, and reinvigorate the Rhode Island economy. For more, see the successes from Bob's first, second, third, and fourth term as State Rep. or check out his campaign blog.